An elaborated long fabric that women in India love to don ceaselessly in order to flatter their curves and flatter them is a Saree to us! Till the last decade, women wore this garment mainly at festive seasons or other social events. But with time, the fashion-driven masses of our country have started carrying this garment in their everyday life as a part of their fashion fix. In fact, this traditional outfit has made its presence felt in the mainstream world with popular magazines like Vogue promoting it in their articles and encouraging women around the world to wear the same. Though women are charged-up in filling their wardrobe with sarees, but short height women are especially reluctant in donning the same. It’s a well-established belief that women with short height look shorter in a saree. But it is not true. With some effective and smart drapes, women with short height can also carry this garment with confidence. The thing with sarees is that it comes with a lot of draping styles. From half saree to mermaid saree, the styles are indefinite. But for the women with short height, the best way to drape is the ‘nivi’ way. Nivi style drapes are the basic and minimalistic types yet they look classy on women of all body types, especially for women with short height. All you need to do is tie your saree with a maximum number of plates resting in front on your belly button and the pallu should rest on your left shoulder, neatly pleated. 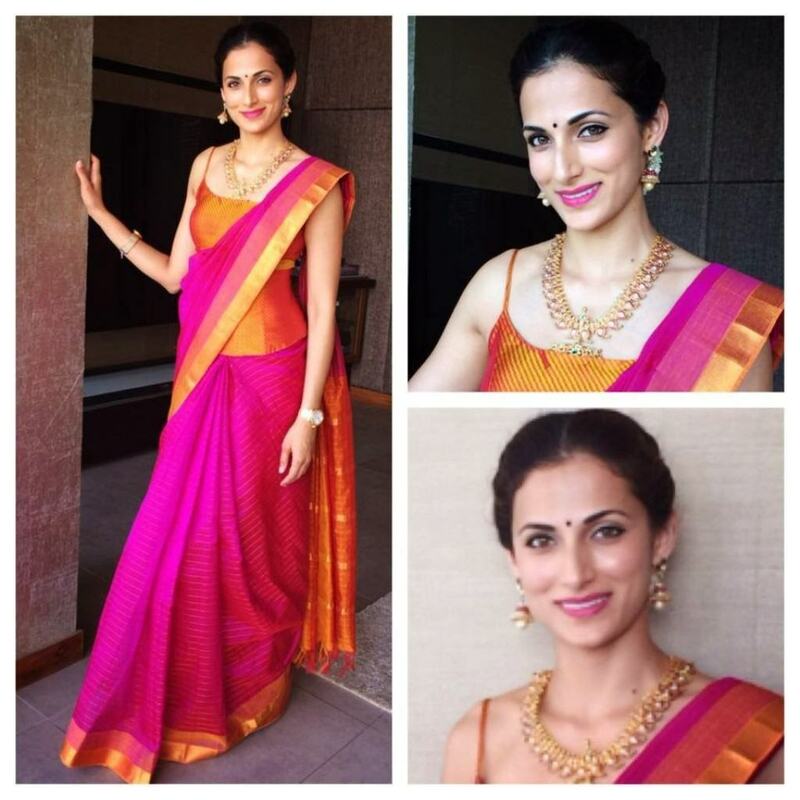 If you are craving for a stylised fit of your saree, you can try this designer’s trick. The trick to doing it is with the pallu. 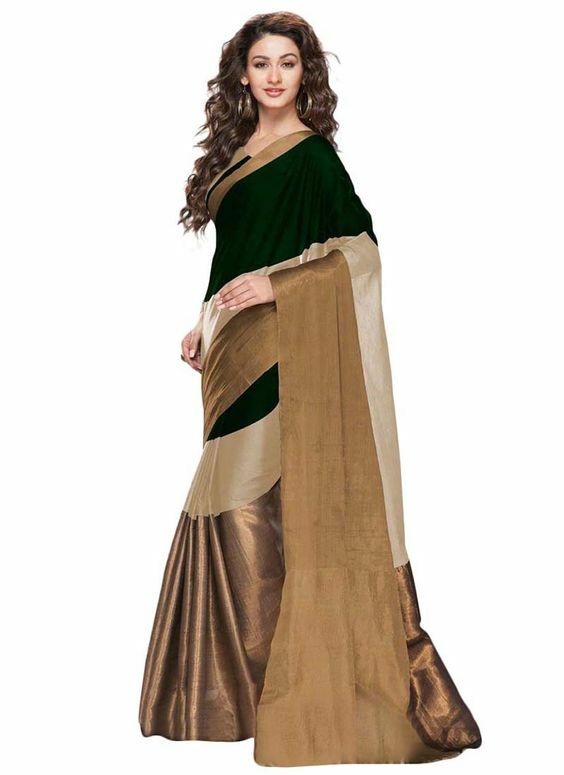 The pallu can be pleated with a thickness of 1.5-2 inches just like the picture below. This will give your attire a new dimension and at the same time complement your curvy petite waistline. You will see the whole look is changed and you will look slender and tall. The fabric is often ignored when one binges on a saree. We often pick the fabrics whose colour and prints we like the best. But beware, ladies,a figure flattering saree can never be compromised with a haste decision. Petite women look smothering in chiffon and silk, but a pure Kanjivaram saree with gold brocade border is the perfect saree type for them. Kanjivaram or Kanchipuram silk is known for its delicate, intricate quality of craftsmanship. The weavers work with utter care in creating this masterpiece, which then turns out to be extremely thin and light. So when you drape this fabric around your petite body, it is going to carve out your figure beautifully well and enhance your slender frame with right depth. Identifying a kanjeevaram is a daunting task. Since it is quite an expensive material, you can gauge its authenticity by plucking out few threads from the saree and burn the thread. A pure Kanjeevaram thread will burn into ashes leaving behind a strong acrid smell of burnt leather or hair. We, women, are very choosy with colours, prints and patterns. We tend to develop a fine taste for the fashion from an early age. Though we must gauge our choices in order to flatter our bodies and make them look their best. So for women with the small height, they must choose a saree with less work over it. The reason for that is not to look short and stout. the saree must have small prints over it. So while choosing the saree, remember to choose prints that are smaller in size such as floral prints over Pan (spade) design. Similarly chose vertical stripes over horizontal stripes. Vertical stripes give an illusion of tallness and add heightto your frame. Another important facet in a saree is its colour. Women with small height and petite figure must pick bold resounding colours like pink, bottle green, black, etc. Bold colours will instantly make your frame look slender yet well defined. Like the saree’s fabric, the blouse with vertical stripes looks amazing. Stripes create an optical illusion and women seem taller to the onlooker. The most important part of any attire is styling and so is the case with a saree. Women with small height must embrace one formula, which is – Less is more. So while accessorising they must keep it all minimum- the makeup, the hairdo, and the jewellery. Though, women can experiment with the blouses. Blouses with Halter necks, boat-necks, and full sleeves are especially for the women who are petite. 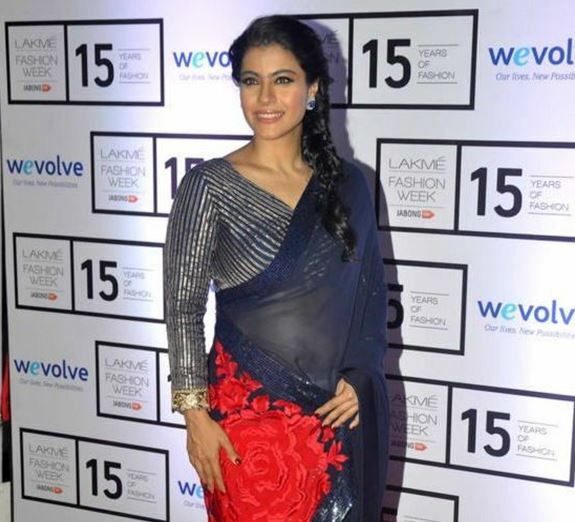 Try a headband with your bold-hued saree for adding that elongated dimension to your whole look. Headbands and high buns are the hot favourites this season. Heels are a part of accessorising but heels have an indispensable prominence in adding dimension to your visual appeal and adding a little drama to your outfit. The primary purpose, as we all know, of the heels is to make you look taller. But the right kind of heels will make you look classy as well. Stilettos are a great choice with sarees since they are visible and add a shimmery touch to the whole look. Choose a golden/silver shimmer depending on your saree. Other than that, peep toe heels and strappy sandals are a sultry choice. With sarees, always choose platforms or wedges because they are easier to walk in. Also, make sure while you drape your saree that the base of the heels hides beneath the saree. But don’t worryabout that in a stiletto or peep toe. They will be visible and impart an elongated yet catchy look. Previous Post How to Wear a Nine Yard Saree Next Post How to Wear Saree to Look Slim?